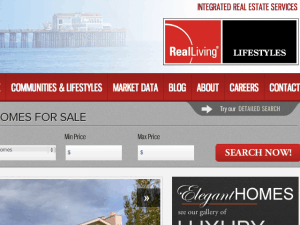 As of yesterday morning, San Diego’s newest real estate brokerage, Real Living Lifestyles, has a brand new real estate brokerage website from the team at Virtual Results. The site features a wealth of information to satisfy buyers and sellers in the greater San Diego area, as well as agents who may be looking to join their rapidly expanding team. It’s a delicate mix to satisfy those diverse audiences, but we feel we’ve struck the right balance. This site is just the beginning, with many improvements to come; however the launch of their fantastic website celebrates the success of their official move yesterday from being Windermere Exclusive Properties to Real Living Lifestyles. As part of our synergy with Real Living Lifestyles, we are offering a special discount on our predesigned websites that work platform (PDW) for Real Living Lifestyles agents who are seeking to revamp and improve their web presence in 2011. Starting today, and for the NEXT 90 DAYS ONLY, Real Living Lifestyle agents can get a PDW for a special introductory price! We even have a specially designed Real Living color scheme for you to use if you wish, or you can choose from any of the other 12 color schemes currently available. Our first Real Living Lifestyles example is Kurt Maier’s brand new site, seen at KurtMaier.com. If you’re an agent with Real Living Lifestyles and interested in getting onboard with your own predesigned website that works, please get in touch with us or talk to your Marketing Director, Erica Liodice. Real Living Lifestyles agents, brokers, and staff — welcome to the Virtual Results family! We’re thrilled to have you. If you are a brokerage from a different area and want your own full brokerage site or would like to offer the best real estate websites available to your agents, let us know; we’d love to speak with you about the full range of services we offer. Our very own Jim Marks spoke at WordCamp Phoenix back in January. The topic was “SEO Tips for Realtors”. Is Your Website Converting Traffic to Leads and SEO Optimized? What is the true value of your website to your business? Sure, there is some branding value and consumers expect every professional to have a website — but if your website is not producing leads and clients for you, what’s the point? We happen to know a thing or two about real estate websites from years of building websites that work and monitoring analytics on them, and are willing to give you a few pointers to those with a desire to improve their web presence. Without a solid underlying site structure to build upon, any off site SEO effort is going to be wasted. If your website is not performing, and you want to better understand why, click here to get your free website critique courtesy of the team at Virtual Results! What is the difference between a category and a tag on my wordpress site? Additionally, I’ve added a page to our Help Center titled “WordPress Questions, Answers, Videos, and Resources” so that our clients have one easy place to find all these questions, answers, videos, and resources from external sources. What other WordPress questions do you have? What Have Your Online Efforts Done for You Lately? As you may or may not know, Virtual Results acts as the internet marketing department for agents, teams, and brokers around the country. The goal of any business website should be to produce leads for you to turn into clients. As part of our consulting services, we do 100% unique content creation, craigslist posting, full blown World Class SEO, monitor analytics, A/B testing, and just about everything in between (full range of services outlined here). Last month, the website of one of our consulting clients produced 132 leads in one month. Yes, that was 132 leads in one month! 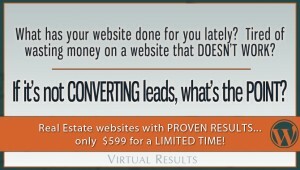 How many leads has your website produced lately? If we don’t produce results, go ahead, fire us. The ROI needs to make sense, but if you and your team are able to turn phone numbers and email addresses into clients, we’re confident it will. We only work with one consulting client in a given market, so contact us today if you’re looking to take your business to the next level. Posted on April 21, 2011 Categories News3 Comments on What Have Your Online Efforts Done for You Lately? From the start, our focus with our predesigned websites that work platform has been to build the best real estate WordPress platform possible; page layouts and colors are one of the things necessary to achieving that goal. 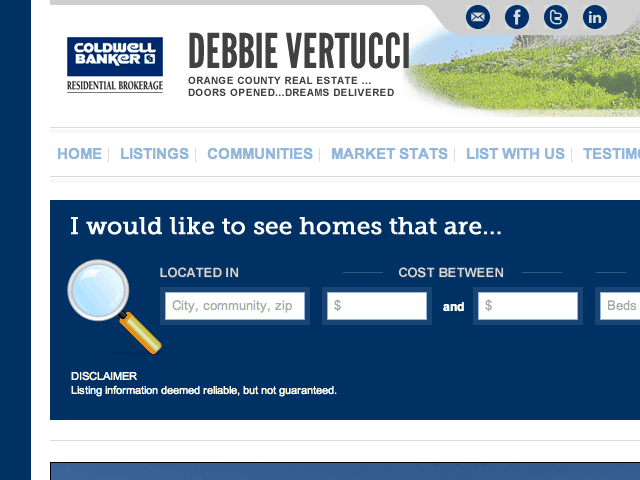 The latest addition to our platform that we’d like to share is a new Coldwell Banker color scheme. There are now 12 different colors to choose from as well as 3 search box variations, and varying other home page layout options. We have several Coldwell Banker clients, but Debbie Vertucci, a Coldwell Banker agent in Irvine, is our first client using this new color scheme. For the brokers reading this, if you want to provide the best WordPress sites to your agents — websites that work — we’d be happy to design a custom color scheme for your agents as part of a brokerage package. If interested in discussing further, we’d love to speak with you. We’ve got a number of other great additions in the works. Stay tuned. The 2nd #retechchat is taking place tonight at 6 PM PST / 9 PM EST. The topic this week will be “mobile marketing“. See you at 6 PST! Today, we’re pleased to launch the new VirtualResults.net! Everyone needs a website revamp from time to time — and we’re no different after 3 plus years with our old site. Being a boutique design company, it’s a challenge to spend our precious design and development time on ourselves when they could otherwise be spent building amazing client websites — but it was finally time to buckle down and revamp our “home base”. We’ve given the site more of a clean “3.0” feel and added a bunch of new content to the site to better reflect our current offerings — including an about page, details on each of our amazing team members and our respective superhuman characteristics, a FAQ, a high level overview of our SEO and consulting services, example Facebook/Twitter/Posterous skins we’ve designed, examples of our new predesigned websites that work, and of course an overview of our predesigned platform. To go with a brand new site, we’re running a two week special on our predesigned websites that work – for the next 2 weeks, you can buy one of our predesigned websites for $599 — that’s $100 off our regular price of $699. Each site includes a full custom header, 13 available color schemes (and growing), and 6 different home page variations. I won’t go into the ins and outs of the platform – instead, I’ll let our examples speak for themselves. So, have a look around and, whether is a website that works or a world class SEO – or anything in between, let us know what we can help you succeed online. We’ve got lots of amazing projects and sites in the works, so check back often for updates..
On Wednesday, I’ll be conducting a WordPress blogging demo and Q&A session with Linda Aaron at Coldwell Banker Bain’s South Lake Union Office. If you are an agent/broker with CBBain in the Greater Seattle area and looking to learn more about WordPress or have a few specific questions you want answered, come on by between 1 and 4 Wednesday afternoon. You can RSVP here. 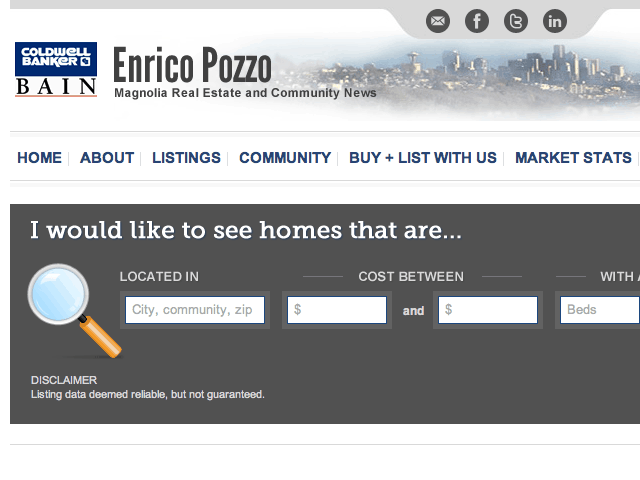 Here’s an example website that we did for Enrico Pozzo from the Lake Union office – MagnoliaListings.com. We have a new promo offer for our predesigned websites that work platform that we wanted to share. Going forward, those who are our 1st client in your respective MLS get $200 OFF the standard $699 setup price. Our partner, Diverse Solutions, has been adding MLS markets like crazy (have you been following their blog updates? ), so we want to give agents in those markets an incentive to go with a best in class website to go along with their best in class IDX. Now, instead of hooking up Diverse to that antiquated website of yours from the stone age, you can hook it up to an amazing professionally designed WordPress web site that provides the base SEO foundation and overall flexibility to grow your business over the next decade. We can have your site ready to add content to within 48 hours of payment, assuming you can give us direction and graphics for the custom header. If you’re curious what our predesigned websites look like, you can take a look at Loftsoma.com, LaPalmaHomeFinder411, or Lake St Clair Life. Here are some more example predesigned sites. So, if you are looking to upgrade to a website that works, make sure to tell us your MLS and ask us whether you are eligible for the $200 discount when you speak with us. $499 for one of these websites is an amazing amazing deal (in my humble opinion anyway)!